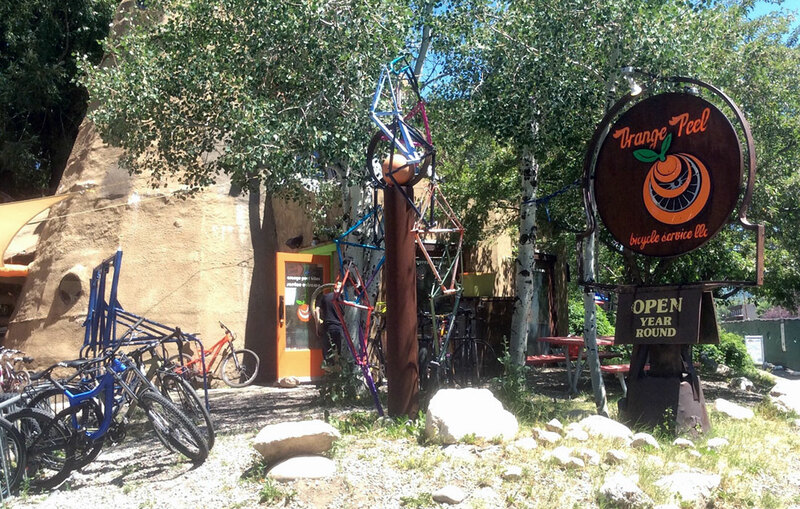 In 1999 Orange Peel Bicycle Service was established in a 500-square-foot space at the back of the “Little Red House” in an alley in downtown Steamboat Springs, CO. Once a residential house dating back to the town’s early days, it had been converted into commercial use and was a hive of outdoor sports-related businesses. Besides Orange Peel, there was outdoor gear retailer and apparel maker BAP! (Bwear Action Products), a national paddle-sports magazine, the offices of Big Agnes and a nascent Honey Stinger. In a stroke of good luck and a leap of faith, in 2005 Orange Peel was able to move into one of Steamboat’s most iconic—and weird—buildings, a one-of-a-kind DIY job built by Moots founder Kent Eriksen around a 30-foot-tall, cone-shaped sawdust incinerator from a local lumber mill and a repurposed ski lift tower. Today, Orange Peel has the perfect location. It’s in the heart of the lively commercial district on a highly visible corner, flanked by restaurants and quaint shops. Across one street is a popular town park and the library, and across the other is the Yampa River and a 7.5-mile bike path. It’s at the good end of town for road biking access, and singletrack is less than a minute from the front door.